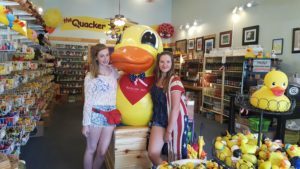 At our Quacker Gift Shop in Grand Lake, Colorado we see people from all over the world each and every day who find rubber duckies the most special of things. Our Ducktor Bill, and his sister Ducktor Mallard in Manit ou Springs greet visitors as they come into the stores. As a part of our new website launches, we had a fun idea…why not invite our visitors, all of them here for a visit, to take their picture with the Grand Ducktor, tell a little story of how they got here and share it with us. We’ll take your story and add it to our scrapbook. Here on the Rubber Duck Stop, you can share your story too. Take a picture with your favorite duck, and send to us at scrapbook@quackergiftshop.com. Your new stop for all things ducky! We have a great new way for you to buy your favorite duckies. Get to know our new rubber duck shopping site today! Your spot for that delicious fudge all year long. Look for our new improved site this fall that will feature our gourmet foods too! Taste buds delight! Join us with a new social experiment. We invite you to send us your favorite duckie pictures. We will post it in our scrapbook for you to share and all to see. Being a quack just got even better! Ducky Derbys are a great fundraiser and a ton of fun too! Explore and learn how a duck derby could be just the idea for you! Coming Soon.